For this portfolio, I wanted convenient updates. I wanted the “codes hooked-up under the hood” with a framework lending to responsive design and portfolio management. And, needed the flexibility to customize the HTML and CSS. Found a solution with a WordPress template on themeforest.com, the base for this site. It included GMPG, jQuery, JSON and responds to Viewport type. I controlled elements using custom HTML and CSS codes, styling text and layout. And added a little .php for page redirect. The brand says, “straightforward, fun, bright, forward thinking/feeling with a hint of online”, incorporating clean lines and room to breath, Roboto a modern flexible sans serif and a bit of material design for interactivity. 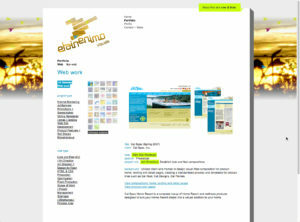 Find out a little about past elainenimo.com sites, as far as aesthetics, design and technology throughout the years. I’m sentimental of past elainenimo.com sites, so I put up an area to remember them. Reminiscing on the work that went into each site, I see the shift in technology and aesthetics as regards to front-end design and trends. It’s amusing to see web technologies evolve, via form and function. 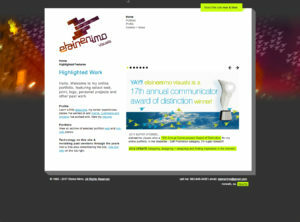 Visit the site’s history from 1998 – 2010 here.